In this episode, Jay is joined by singer, rapper and musician Just Aaron to address the question: How do young believers in Jesus Christ struggle to stay saved? 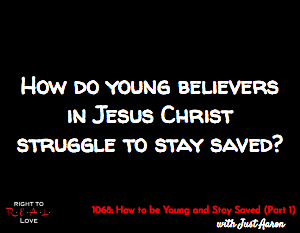 How do young believers in Jesus Christ struggle to stay saved? All believers in Jesus Christ encounter struggles. The importance of us staying connected to Jesus Christ. How young believers in Jesus Christ struggle to stay saved. Aaron shares how reading God’s Word helped him to better understand the spiritual battle we are all a part of. The same way only you could decide to invite Christ into your life, similarly it is your responsibility to remain connected to God. Speak to God (ask Him questions) and watch for His response (in your experiences).